The professional machine with a 2.2 ltr. glass jug and the unique Melitta® pyramid filter for sediment-free filtered coffee. The Melitta® filter coffee machine 190 works according to the classical Melitta® filtering method. Advantage: Even if only a small quantity of coffee is fi ltered, with the Melitta® pyramid filter you will always have a high rate of extraction and sediment-free, aromatic coffee. 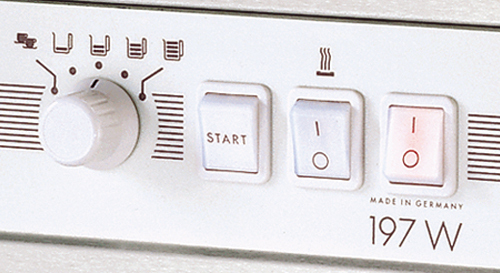 But the Melitta® 190 not only has economical but also ecological advantages. Coffee ground and filter paper are compostable and thus enable eco-friendly waste-disposal. device which prevents annoying subsequent dropping. This guarantees easy and safe handling. In combination with the filter paper, the pyramid filter ensures excellent flavour development and coffee powder yield with large or small quantities. The filter paper is made of highest oxygen bleached cellulose quality. The result of this cooperation: Finest, grounds-free coffee, which remains fresh, even after longer standing times.